In loving memory of John Forbes Nash Jr.
2, 3, 5, 7, 11, 13, 17, 19, 23, 29, p. What is p? 31. What is the next p? It’s 37. The p after that? 41. And then? 43. How, but… …how do you know what comes next? Present an argument or formula which (even barely) predicts what the next prime number will be (in any given sequence of numbers), and your name will be forever linked to one of the greatest achievements of the human mind, akin to Newton, Einstein and Gödel. Figure out why the primes act as they do, and you will never have to do anything else, ever again. The properties of the prime numbers have been studied by many of history’s mathematical giants. From the first proof of the infinity of the primes by Euclid, to Euler’s product formula which connected the prime numbers to the zeta function. From Gauss and Legendre’s formulation of the prime number theorem to its proof by Hadamard and de la Vallée Poussin. Bernhard Riemann still reigns as the mathematician who made the single biggest breakthrough in prime number theory. His work, all contained in an 8 page paper published in 1859 made new and previously unknown discoveries about the distribution of the primes and is to this day considered to be one of the most important papers in number theory. Since its publication, Riemann’s paper has been the main focus of prime number theory and was indeed the main reason for the proof of something called the prime number theorem in 1896. Since then several new proofs have been found, including elementary proofs by Selberg and Erdós. Riemann’s hypothesis about the roots of the zeta function however, remains a mystery. 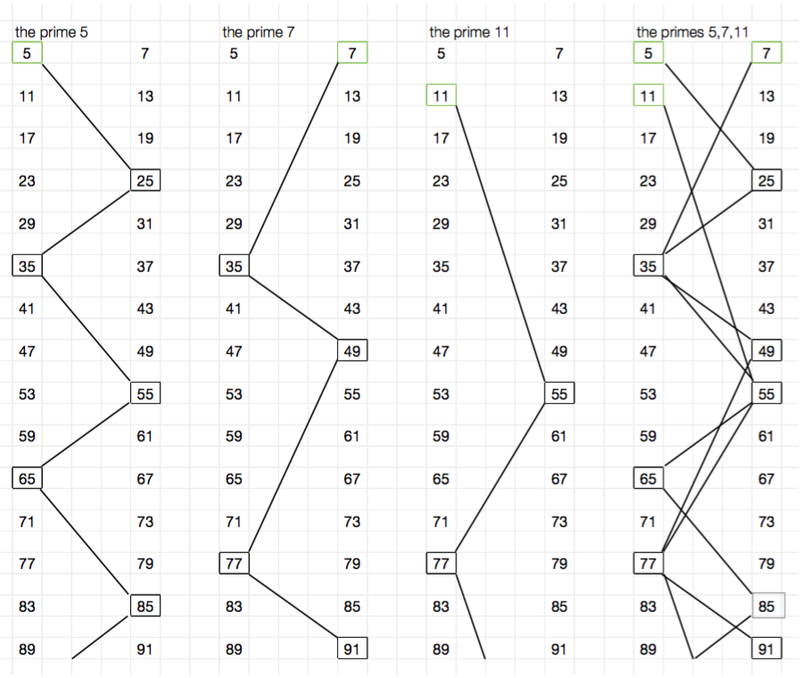 - If Q is prime, you’ve found a prime that was not in your “list of all the primes”. - If Q is not prime, it is composite, i.e made up of prime numbers, one of which, p, would divide Q (since all composite numbers are products of prime numbers). Every prime p that makes up P obviously divides P. If p divides both P and Q, then it would have to also divide the difference between the two, which is 1. No prime number divides 1, and so the number p cannot be on your list, another contradiction that your list contains all prime numbers. There will always be another prime p not on the list which divides Q. Therefore there must be infinitely many primes numbers. Why are primes so hard to understand? We understand composite numbers well. Those are all the non-primes. They are made up of primes, but you can easily write a formula that predicts and/or generates composites. Such a “composite filter” is called a sieve. The most famous example is named the “Sieve of Eratosthenes” from c. 200 BCE. What it does, is simply mark the multiples of each prime up to a set limit. So, take the prime 2, and mark 4,6,8,10 and so on. Next, take 3, and mark 6,9,12,15 and so on. What you’ll be left with is only primes. Although very simple to understand, the sieve of Erathosthenes is as you can imagine, not very efficient. One function simplifying your work significantly is 6n +/- 1. This simple function spits out all primes except 2 and 3, and removes all multiples of 3 and all even numbers. Put in for n = 1,2,3,4,5,6,7 and behold the result: 5,7,11,13,17,19,23,25,29,31,35,37,41,43. The only non-prime numbers generated by the function are 25 and 35, which can be factorized into 5 x 5 and 5 x 7, respectively. The next non-primes are, as you can imagine, 49 = 7 x 7, 55 = 5 x 11 and so on. Simple right? Illustrating this visually, I’ve used something that I’m calling “composite ladders”, a simple way to see how the composite numbers generated by the function are laid out for each prime, and combined. In the first three columns of the image below, you neatly see the prime numbers 5, 7 and 11 with each respective composite ladder up to and including 91. 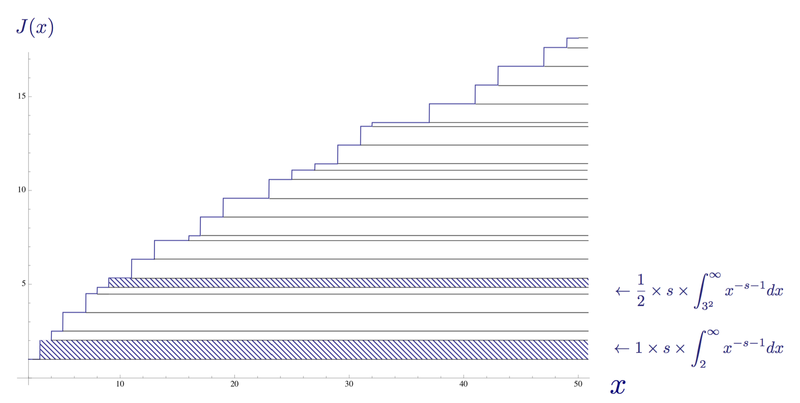 The chaos of the fourth column, showing how the sieve has removed all but the prime numbers, is a fair illustration of why prime numbers are so hard to understand. So what does this all have to do with this thing you may have heard of called the “Riemann hypothesis”? Well, said simply, in order to understand more about primes, mathematicians in the 1800s stopped trying to predict with absolute certainty where a prime number was, and instead started looking at the phenomenon of prime numbers as a whole. This analytic approach is what Riemann was a master of, and where his famous hypothesis was made. Before I can explain it however, it is necessary to get familiar with some fundamental resources. 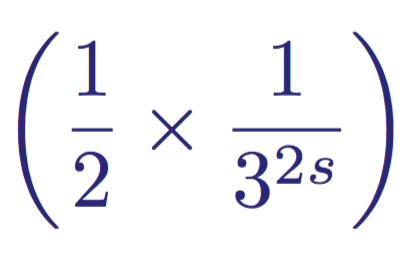 This sum was proven to be divergent by Oresme (not having a finite limit, not approaching/tending towards any particular number, but running off into infinity). If you put in for n = 1, you get the harmonic series, which diverges. For all values of n > 1 however, the series converges, meaning the sum tends towards some number as the value of r increases, i.e it does not run off into infinity. This expression first appeared in a paper in 1737 entitled Variae observationes circa series infinitas. The expression states that the sum of the zeta function is equal to the product of the reciprocal of one minus the reciprocal of primes to the power s. This astonishing connection laid the foundation for modern prime number theory, which from this point on used the zeta function ζ(s) as a way of studying primes. If this process is familiar to you, it is because what Euler constructed was in fact, a sieve, much like the Sieve of Eratosthenes. He is filtering out non-prime numbers from the zeta function. Wasn’t that beautifully done? Put in for s = 1, and find the infinite harmonic series, re-proving the infinity of the primes. The sum does not contain reciprocals of numbers which divide by some prime squared, e.g 4,8,9 and so on. Back to primes. To understand how primes are distributed as you go higher up the number line, without knowing where they are, it is useful to instead count how many there are up to a certain number. The prime counting function π(x), introduced by Gauss, does just that, gives the number of primes less than or equal to a given real number. 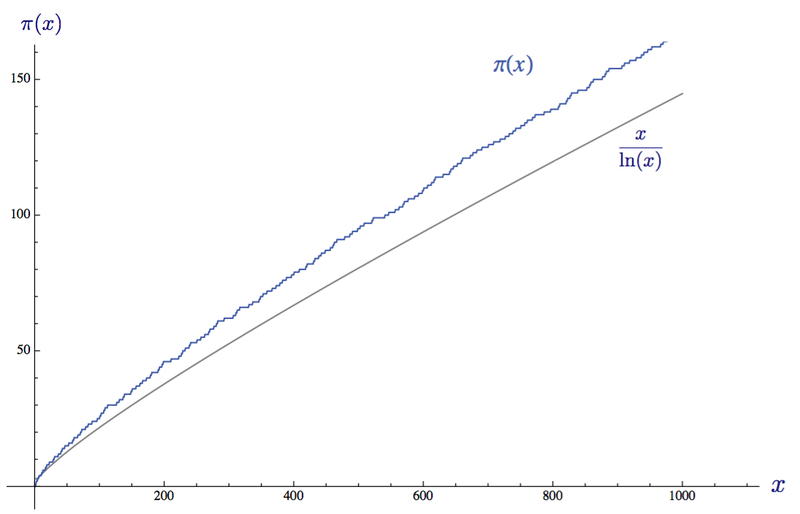 Given that there is no known formula for finding primes, the prime counting formula is known to us only as a plot, or step function increasing by 1 whenever x is prime. 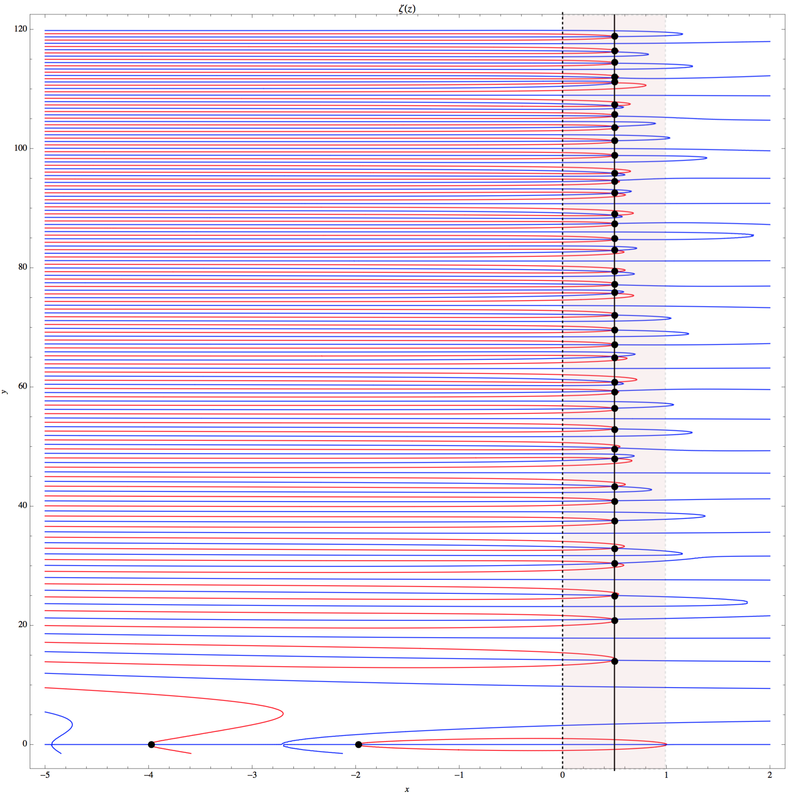 The plot below shows the function up to x = 200. 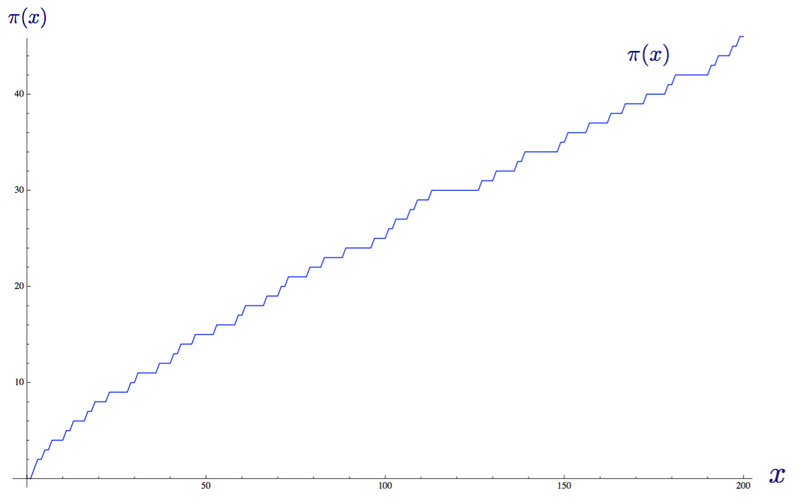 The prime counting function π(x) up to x = 200. In terms of probability, the prime number theorem states that if you pick a natural number x at random, the probability P(x) that that number will be a prime number is about 1 / ln(x). This means that the average gap between consecutive prime numbers among the first x integers is approximately ln(x). The gamma function Γ(z) is defined for all complex values of z larger than zero. Complex numbers, as you probably know, are a class of numbers with an imaginary part, written as Re(z) + Im(z), where Re(z) is the real part (ordinary real number) and Im(z) is the imaginary part, denoted by the letter i. A complex number is typically written in the form z = σ + it where sigma σ is the real part and it is the imaginary part. Complex numbers are useful because they allow mathematicians and engineers to evaluate and work on problems where ordinary real numbers will not allow it. Visualized, complex numbers extend the traditional one-dimensional “number line” into a two-dimensional “number plane”, called the complex plane, in which the real part of a complex number is plotted on the x-axis and the imaginary part is plotted on the y-axis. Using this identity, one can obtain values for z below zero. It does not however give values for negative integers, as they are not defined (technically they are singularities, or simple poles). Now that we’ve covered the necessary fundamental resources, we can finally begin making the connection between prime numbers and the Riemann Hypothesis. German mathematician Bernhard Riemann was born in Breselenz in 1826. Student of Gauss, Riemann published work in the fields of analysis and geometry. His biggest contribution was likely in the field of differential geometry, where he laid the groundwork for the geometric language later used in Einstein’s General Theory of Relativity. An explicit formula for the number of primes less than a given number by using the Riemann prime counting function, defined using the non-trivial zeros of the Riemann zeta function. An incredible feat of engineering and creativity, the likes of which probably hasn’t been seen since. Absolutely astounding. We’ve seen the intimate relationship between prime numbers and the zeta function shown by Euler in his product formula. Beyond this connection however, not much was known about the relationship and it would take the invention of complex numbers to show explicitly just how interconnected the two are. 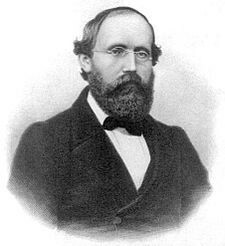 Riemann was the first to consider the zeta function ζ(s) for a complex variable s, where s = σ + it. 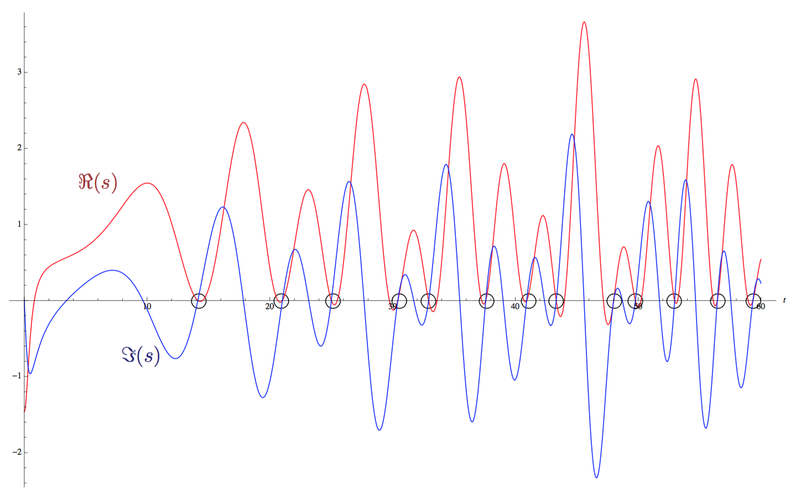 The Riemann Zeta Function for n where s = σ + it is a complex number where both σ and t are real numbers. Dubbed the Riemann zeta function ζ(s), it is an infinite series which is analytic (has definable values) for all complex numbers with real part larger than 1 (Re(s) > 1). In this area, it converges absolutely. In order to analyze the function in areas beyond the regular area of convergence (when the real part of the complex variable s is larger than 1), the function needs to be redefined. Riemann successfully does this by analytic continuation to an absolutely convergent function in the half plane Re(s) > 0. This new definition for the zeta function is analytic everywhere in the half plane Re(s) > 0, except at s = 1 where there is a singularity/simple pole. This is called a meromorphic function in this domain, because it is holomorphic (complex differentiable in a neighborhood of every point in its domain) except for at the simple pole s = 1. It is also a great example of something called a Dirichlet L-function. In his paper, Riemann does not stop there. He goes on to analytically continue his zeta function ζ(s) to the entire complex plane, using the gamma function Γ(z). In the interest of keeping this article simple, I will not show this calculation, but I strongly urge you to read it for yourself as it demonstrates Riemann’s remarkable intuition and technique supremely well. In this form, one can see that the term ψ(s) decreases more rapidly than any power of x, and so the integral converges for all values of s.
The roots/zeros of the zeta function, when ζ(s)=0, can be divided into two types which have been dubbed the “trivial” and the “non-trivial” zeros of the Riemann zeta function. This product becomes zero when the sine term becomes zero. It does so at kπ. So, e.g for a negative even integer s = -2n, the zeta function becomes zero. For positive even integers s = 2n however, the zeros are cancelled out by the poles of the gamma function Γ(z). This is easier to see in the original functional form, where if you put in for s = 2n, the first part of the term becomes undefined. From Euler’s product formulation of zeta, we can immediately see that zeta ζ(s) cannot be zero in the area with real part of s larger than 1 because a convergent infinite product can only be zero if one of its factors is zero. The proof of the infinity of the primes denies this. We’ve now found the trivial zeros of zeta in the negative half plane when Re(s) < 0 and shown that there cannot be any zeros in the area Re(s) > 1. The area between these two areas however, called the critical strip, is where much of the focus of analytic number theory has taken place for the last few hundred years. 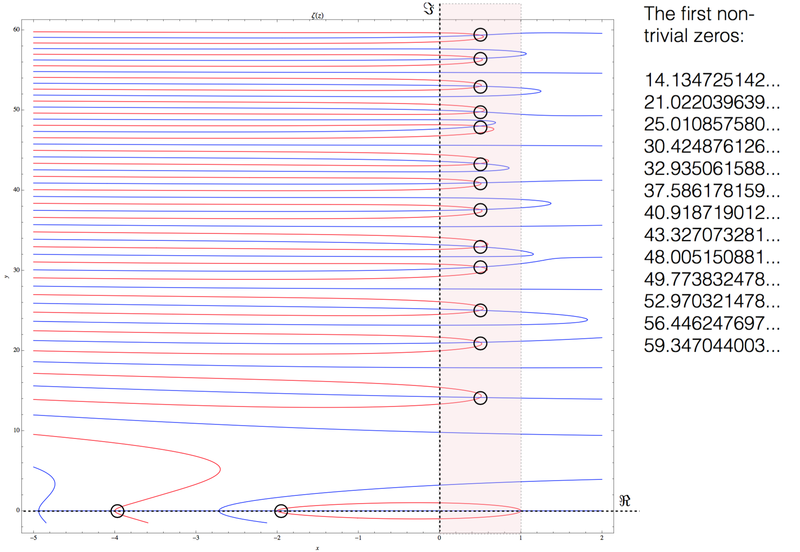 In the plot above I have graphed the real parts of zeta ζ(s) in red and the imaginary parts in blue. We see the first two trivial zeros in the lower left when the real part of s is -2 and -4. In between 0 and 1, I have highlighted the critical strip and marked off where the real and imaginary parts of zeta ζ(s) intersect. These are the non-trivial zeros of the Riemann zeta function. Going to higher values we see more zeros, and two seemingly random functions which appear to be getting denser as the imaginary part of s gets larger. Which means that the function is symmetric about the vertical line Re(s) = 1/2 so that ξ(1) = ξ(0), ξ(2) = ξ(-1) and so on. This functional relationship (the symmetry of s and 1-s) combined with the Euler product formula shows that the Riemann xi function ξ(s) can only have zeros in the range 0 ≤ Re(s) ≤ 1. The zeros of the Riemann xi function in other words correspond to the non-trivial zeros of the Riemann Zeta function. In a sense, the critical line R(s) = 1/2 for the Riemann Zeta function ζ(s) corresponds to the real line (Im(s) = 0) for the Riemann xi function ξ(s). Looking at the two charts above, one should immediately take note of the fact that all the non-trivial zeros of the Riemann Zeta function ζ(s) (the zeros of the Riemann xi function) have real part Re(s) equal to 1/2. Riemann briefly remarked on this phenomenon in his paper, a fleeting comment which would end up as one of his greatest legacies. 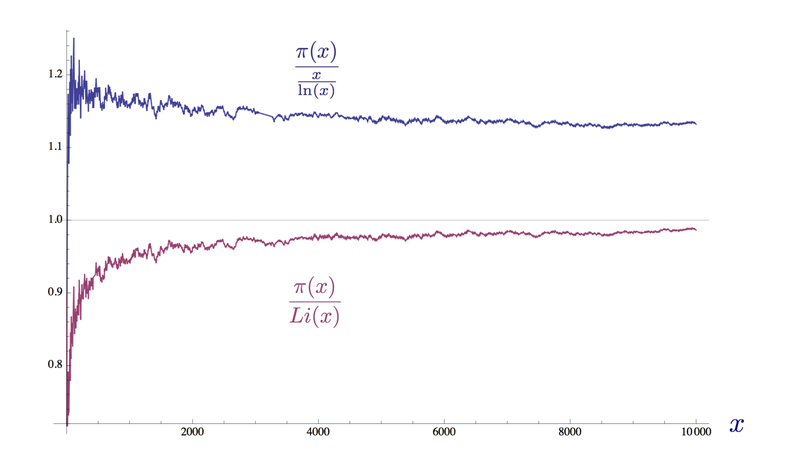 The non-trivial zeros of the Riemann zeta function ζ(s) have real part Re(s) = 1/2. This is the modern formulation of the unproven conjecture made by Riemann in his famous paper. In words, it states that the points at which zeta is zero, ζ(s) = 0, in the critical strip 0 ≤ Re(s) ≤ 1, all have real part Re(s) = 1/2. If true, all non-trivial zeros of Zeta will be of the form ζ(1/2 + it). An equivalent statement (Riemann’s actual statement) is that all the roots of the Riemann xi function ξ(s) are real. In the plot below, the line Re(s) = 1/2 is the horizontal axis. The real part Re(s) of zeta ζ(s) is the red graph and the imaginary part Im(s) is the blue graph. The non-trivial zeros are the intersections between the red and blue graph on the horizontal line. 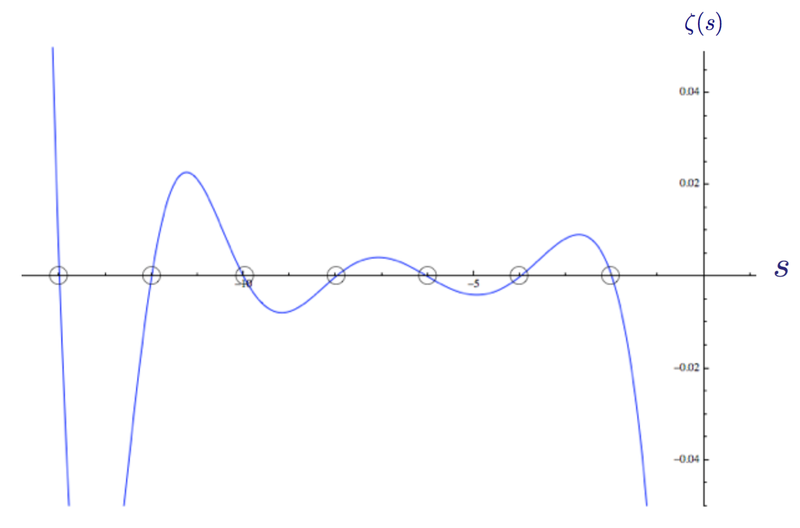 The first non-trivial zeros of the Riemann zeta function on the line Re(s) = 1/2. 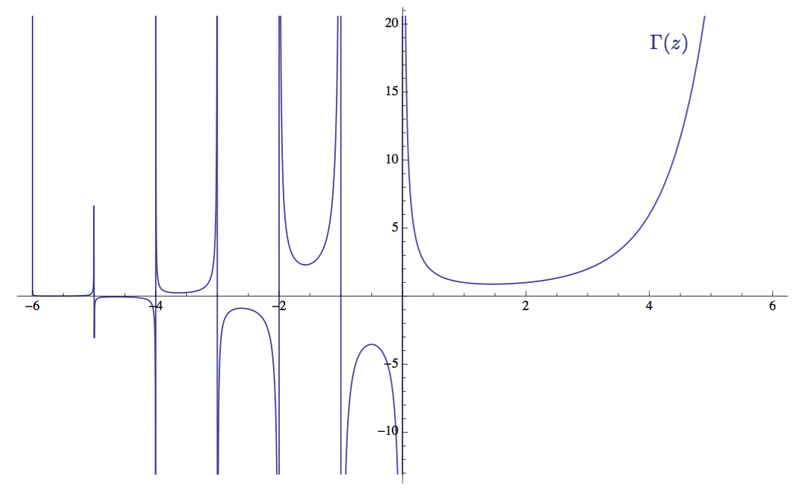 If the Riemann hypothesis turns out to be true, all the non-trivial zeros of the function will appear on this line as intersections between the two graphs. There are many reasons to believe the truth of Riemann’s hypothesis about the zeros of the zeta function. Perhaps the most compelling reason for mathematicians is the consequences it would have for the distribution of prime numbers. The numerical verification of the hypothesis to very high values suggests its truth. In fact, the numerical evidence for the hypothesis is far strong enough to be regarded as experimentally verified in other fields such as physics and chemistry. However, the history of mathematics contains several conjectures that had been shown numerically to very high values and still were proven false. Derbyshire (2004) tells the story of the Skewes number, a very very large number that gave an upper bound, proving the falsity of one of Gauss’ conjectures that the logarithmic integral Li(x) is always greater than the prime counting function. It was disproven by Littlewood without an example, and then shown to must fail above Skewes’ very, very large number ten to the power of ten, to the power of ten, to the power of 34, showing that even though Gauss’ idea had been proven to be wrong, an example of exactly where is far beyond the reach of numerical calculation even today. This could also be the case for Riemann’s hypothesis, which has “only” been verified up to ten to the power of twelve non-trivial zeros. Using the truth of the Riemann hypothesis as a starting point, Riemann began studying its consequences. In his paper he writes; “…it is very probable that all roots are real. Of course one would wish for a rigorous proof here; I have for the time being, after some fleeting vain attempts, provisionally put aside the search for this, as it appears dispensable for the next objective of my investigation.” His next objective was relating the zeros of the zeta function to the prime numbers. The first thing to notice about this function is that it is not infinite. At some term, the counting function will be zero because there are no primes for x < 2. So, taking J(100) as an example, the function will be made up of seven terms because the eight term will include an eight root of 100, which is approximately equal to 1.778279.., so this prime counting term becomes zero and the sum becomes J(100) = 28.5333…. This new expression is still a finite sum because J(x) is zero when x < 2 because there are no primes less than 2. Which we know to be the number of primes below 100. Next, using the well known Maclaurin Taylor series, he expands each log term on the right hand side, creating an infinite sum of infinite sums, one for each term in the prime number series. In other words, using the Euler product formula, Riemann showed that it is possible to represent the discrete prime counting step function as a continuous sum of integrals. Below our example term is shown as part of the area under the Riemann prime counting function graph. Riemann had with this connected his zeta function ζ(s) with his Riemann prime counting function J(x) in an identity statement equivalent to the Euler product formula, in the language of calculus. 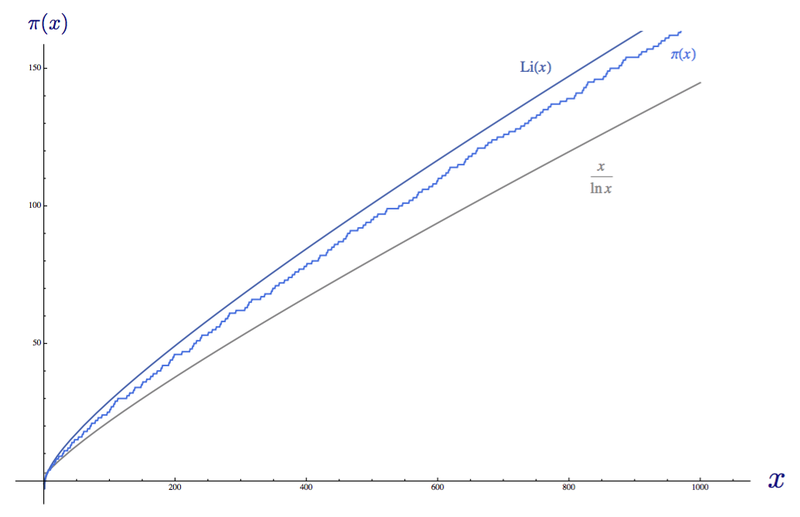 The first term, or “principle term” is the logarithmic integral Li(x), which is the better estimation of the prime counting function π(x) from the prime number theorem. It is by far the largest term, and like we have seen earlier, an overestimate on how many primes there are up to a given value x. The second term, or “periodic term” is the sum of the logarithmic integral of x to the power ρ, summed over ρ, which are the non-trivial zeros of the Riemann zeta function. It is the term that adjusts the overestimate of the principle term. The fourth and final term is an integral which is zero for x < 2 because there are no primes smaller than 2. It has its maximum value at 2, when its integral equals approximately 0.1400101…. 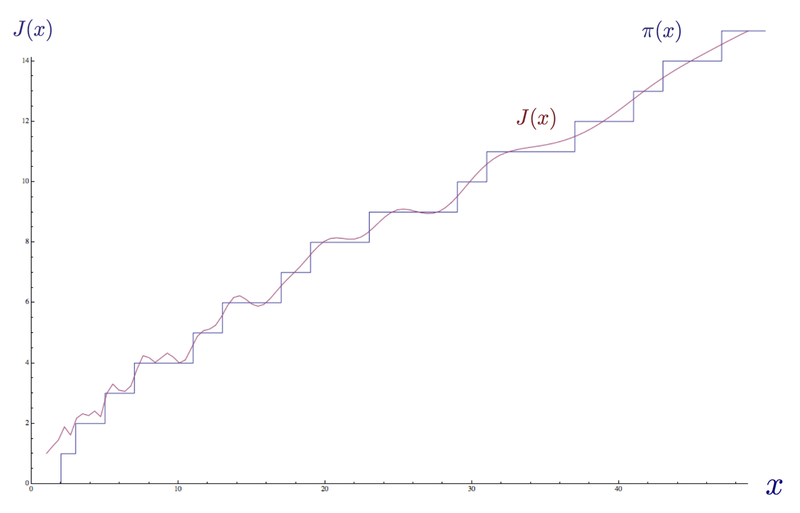 The prime counting step function π(x) being approximated by the explicit formula for the Riemann prime counting function J(x) using the first 35 non-trivial zeros ρ of the Riemann Zeta function. In the chart above, I have approximated the prime counting function π(x) by using the explicit formula for the Riemann prime counting function J(x), and summed over the first 35 non-trivial zeros of the Riemann zeta function ζ(s). We see that the periodic term causes the function to “resonate” and begin to approach the shape of the prime counting function π(x). Below you can see the same chart, using more non-trivial zeros. 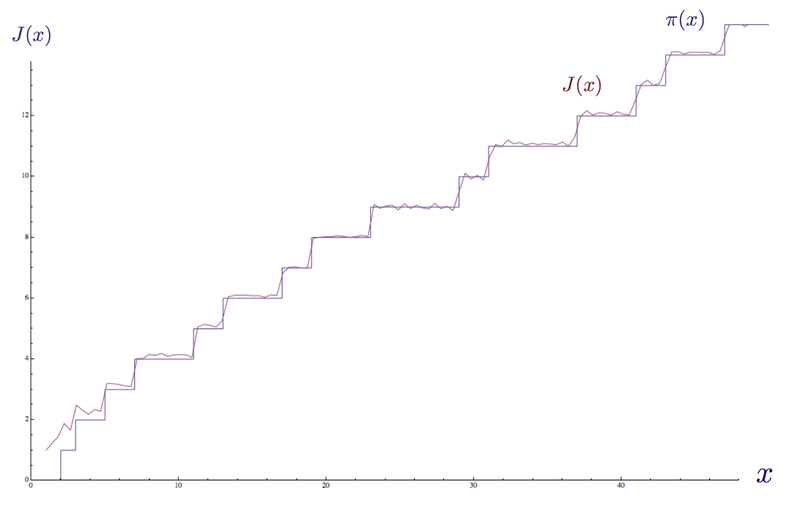 The prime counting step function π(x) being approximated by the explicit formula for the Riemann prime counting function J(x) using the first 100 non-trivial zeros ρ of the Riemann Zeta function. Using Riemann’s explicit function, one can approximate the number of primes up to and including a given number x to a very high accuracy. In fact, Von Koch proved in 1901 that using the non-trivial zeros of the Riemann zeta function to error-correct the logarithmic integral function is equivalent to the “best possible” bound for the error term in the prime number theorem. Since the death of Riemann in 1866 at the modest age of 39, his groundbreaking paper has remained a landmark in the field of prime- and analytic number theory. To this day Riemann’s hypothesis about the non-trivial zeros of the Riemann zeta function remains unsolved, despite extensive research by numerous great mathematicians for hundreds of years. Numerous new results and conjectures associated with the hypothesis are published each year, in the hope that one day a proof will be tangible. This article is a reformulation of the 2013 undergraduate thesis paper of Jørgen Veisdal. For those interested in further exploring the topic, I especially recommend John Derbyshire’s book ‘Prime Obsession’. If you have a question or comment, please tell me below or send me an email at jorgen.veisdal@ntnu.no.